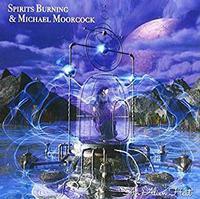 I always like the music from Spirits Burning. This album is no exception. Perhaps what's so impressive about this (more than anything else) is the lineup of musicians featured on the album. Beyond Michael Moorcock and Spirits Burning main man Don Falcone we have Hawkwind (and Moorcock was in Hawkwind at one time) alums Harvey Bainbridge, Adrian Shaw, Mick Slattery and Bridget Wishart. From Blue Oyster Cult we get Albert and Joe Bouchard along with Buck Dharma and Richie Casteliano. Camper Van Beethoven's Jonathan Segel is also on the disc. Additionally there are musicians from artists as far ranging as Astralfish to The Dictators, Nektar and more. All in all, they work together to give us a rocking album with a lot of space rock and other elements in the mix. This is actually a two CD set with a second bonus disc featuring the instrumental mixes of all the songs. Drums bring this into being. The cut powers out from there to some killer Hawkwind like space rock. There are some cool shifts and changes with both more mainstream progressive rock and pop rock showing up on the track. The dropped back melodic jam with guitar soloing propels this into some killer prog rock instrumental territory as it builds outward. There is a bit of a rap at the start of this. The cut works out to something that has a lot of folk rock and psychedelia built into it. It eventually shifts toward more mainstream space rock as it drives forward. There is a definite Blue Oyster Cult vibe to this track in a lot of ways. This rocker has a dynamic and diverse arrangement. There is a bit of a Hawkwind like edge to this cut. It has a lot of genuine weirdness in the mix, too. It's a song that stylistic lands sort of between the first two cuts. That said, there is a lot of space rock turned folk rock here. I dig the female vocals (Ann Marie Casteliano) on this cut quite a bit, and the harmonica (Moorcock) is a nice touch, too. I love the spoken segment later in the track. A driving space rocker with a healthy helping of psychedelia, this is a classy number. It has some particularly expressive guitar fills. The mostly spoken vocal parts are a great touch, too. This is one of my favorite cuts here and it wanders toward a metallic edge at times. For some reason this piece reminds me of Copernicus (the musician not the astronomer). There is plenty of folk prog in the mix. This also has some definite world music. It's a driving cut. The later portions of the cut have some killer bass work and some Blue Oyster Cult like textures. Coming in with much more of a mainstream pop rock sound, there is a Beatles-like element to this. This might be my favorite cut here. It has some mainstream space rock, but there is also hard rock that leans toward heavy metal, and a lot more. The vocals are mostly spoken. This just oozes cool. Space synths start this and drive it forward. It is built on Hawk-like space rock, but has some hints of funk and more in the mix, too. It's a powerhouse rocker that works particularly well. There is a definite BOC element at play on this tune, too. A proggier, space rock driven version of BOC seems to be the musical concept here. At least that's the way the piece comes across to me. There is a lot of BOC sound built into this one. In fact, with a bit different arrangement it would be no stretch of the imagination to think this was a song from the 70s version of that band. An electronic rhythm starts this cut. It builds out from there to an arrangement with a lot of industrial texture to it. Yet there is also plenty of BOC influence here. Late in the track it works out to a piano dominated movement that has a lot of jazz and classical music built into it. A slower, mellower cut, this has a lot of BOC texture, but also a lot of classical music and sedate space rock built into it. More hard rocking, I like the spoken vocal part, but the whole cut is cool. This has more of that BOC thing at play, but plenty of more standard space rock, too. This sounds more like what I expect from Spirits Burning. The cut has a cool mellower space rock texture to it. I love the female vocals (Casteliano again). They bring so much magic to this. This is so trippy and tasty. At over seven and a half minutes of music, this is the longest track here. It's also one of the most dynamic. The slower movement that starts this calls to mind early Pink Floyd in a lot of ways. This works through a number of different sections. I dig the guitar soloing that comes in further down the road. That movement again has a bit of a BOC vibe to it. An abrupt turn around the three and a half mark gives us a new movement that has both some old school rock and roll and some more dramatic prog built into it. The cut resolves back to more familiar territory from there. A hard rocking movement around the five minute mark has almost a hint of modern King Crimson in the mix. We're brought back to that Pink Floyd like section later. A mellower cut, this has plenty of mainstream space rock along with a lot of BOC. I dig the dropped back movement with spoken vocals. This whole track just works so well, though. It's one of the highlights of the set and a great way to end things in style.